Unlocking the mysteries of loading and managing samples and sample libraries on the Motif XF, produced by KEYFAX NewMedia. Full expose of the Motif XF’s new voice and sample storing capacity at the hands of Motif guru Dave Polich. The Motif XF’s revolutionary Flashboard technology for sample storage is widely welcomed but it has been widely misunderstood as well. 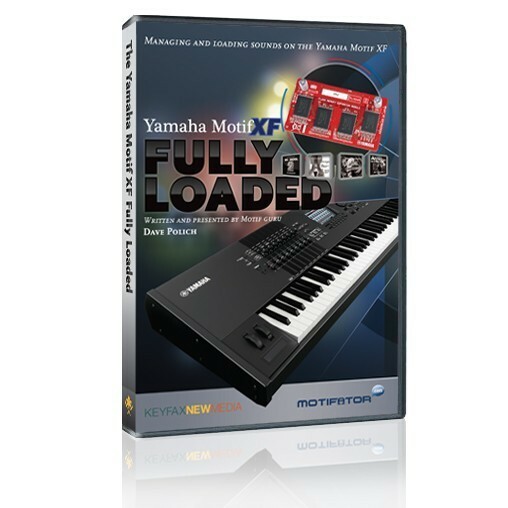 Filmed in HD at Motifator.com Keyfax NewMedia’s studios, the XF Fully Loaded video lifts the lid on some of the instrument’s potentially confusing terminology (USER this and that) and shows you exactly how to manage your voice libraries on the XF platform. In 15 bite-sized sections with handy ‘Section Recaps’ and interspersed with invaluable ‘Power Tips’, Dave Polich explains the twists, turns, and reasonings behind this incredibly power system in words of one syllable. Key Sections are Where Sounds Are Located, Installing A Flashboard, User Memory Vs Flashboards, Loading Single Voices, Dealing With Performances, Loading Multiple Libraries, and Loading XS and EX Voice Libraries. If you own a Motif XF, unless you work for Yamaha (and frankly even then…) this video will be crucial in understanding and harnessing the power of the Motif XF.